Posted August 18, 2006 in 2006/08, Late, Margin Notes, Marvel Kirby, Periods, Serial Posts, z Archive. Jack Kirby did some goofy things from time to time. I always got a chuckle out of the cover for Captain America #197. Cap faces the viewer in a hail of bullets and exclaims “I’ve found an army of underground killers! .. and I’ve got to stop them alone!”. Well of course if he is alone, who is he yelling to? This was done in 1976 and Jack was artist, writer and editor. So you would expect that this was Jack’s doing. 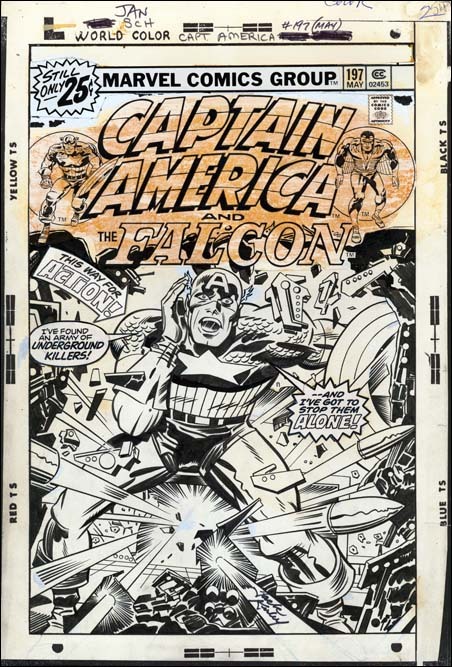 Recently The Jack Kirby Museum has made available to members xeroxes of the pencils for some Captain America art done by Jack. If you are not a member maybe you should consider joining. I say this not really because of the chance to see some great Kirby pencils. Nor because the Kirby Museum hosts my blog. Those are good reasons I guess but I feel you should support the museum as they are one of the few organizations out there actively promoting the study of Jack Kirby. With member support they have done great things but with continuing support I am sure that is only the beginning. Anyway because it is a member’s only viewing I cannot link to the pencil version of Cap #197 that they have. But I hope it is alright if I were to quote what Cap says on the pencils which is “This way for action!! I’ve found an underground army of desperate killers”. Not as punchy as the final version but not at all goofy. All the blurbs on the cover are paste ups on the original art. The pencils had been completely inked, even in places that later were covered by the blurbs. Jack’s penciled word balloon was not inked and the space it had occupied was inked with the same wreck that is found along all the edges. I guess it is possible that Jack changed his mind in the last minute about what should be in the blurbs. But I really suspect that someone at Marvel decided to make changes even though Kirby was supposed to be editor. “This way for action” was removed from Cap’s speech and placed in an arrow and Cap’s exclamation was rewritten somewhat. Just one more example of the lack of respect by some at Marvel at that time for Jack’s efforts. Even though I now feel that Cap’s speech was not Kirby’s fault, I have to admit I like it. It is good for comic art to be goofy at times. I’ve compared many of the pages to the originals, and as you suspected, there were a number of changes in copy, both in the books and the covers. Many times they did not use, or altered, the copy that Kirby suggested. Sometimes it was for the better, sometimes not. One example that I felt was much stronger in Kirby’s version was the Bi-Centenial story where Cap is talking to the Black man he helped. Kirby’s words were stronger, making the character tougher and more realistic (an odd word to use for Kirby writing, but appropriate here). Someone at Marvel rewrote and softened the dialogue. I can’t imagine why. changes might be considered a last minute change by Jack, but multiple ones, I think not. So as you say someone at Marvel was changing things.